I have spent quite a bit of time volunteering for the 1Sky Campaign through our local Michigan affiliate, Clean Water Action. 1Sky is a well-funded coalition of environmental groups promoting three major intiatives known as "1Sky Solutions": 5 million new green energy jobs, reducing global warming pollution and a moratorium on new coal plants. This past month they've been promoting a fun project called Make Art For Climate. 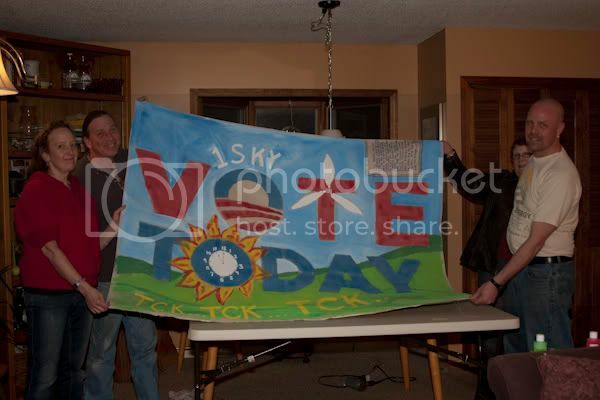 What follows shows how several of us spent two hours last night recycling an Obama campaign banner from 2008 into a piece of art to be delivered to the president prior to his trip to the Copenhagen global climate change summit. World leaders will gather in Copenhagen in December to negotiate a new global climate treaty, and we need to keep the pressure on President Obama and the Senate to lead by supporting strong climate policy here at home. That's why we're kicking off the "Make Art for Climate" house gatherings to urge the President to step up his efforts for strong climate legislation. 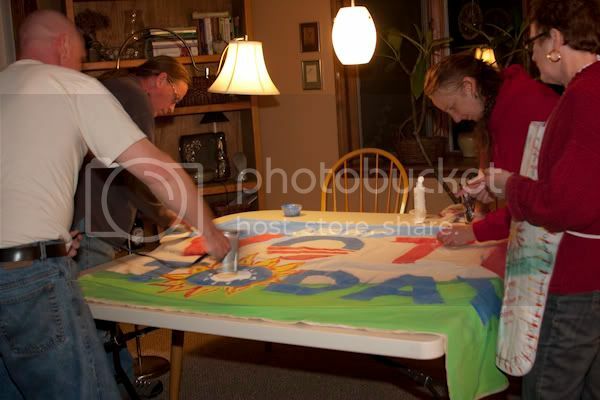 At these house gatherings, you'll get together with friends and neighbors to decorate pieces of fabric with images reflecting the urgency of the climate challenge. This way we'll create a powerful visual display of the need to enact bold climate legislation this year. In December, we'll work with you to deliver your art to important members of the Obama Administration and the Senate, in Washington and across the country. As neighborhood team leaders last year in the Campaign for Change, my wife and I helped to disassemble our Ann Arbor campaign office on Wednesday, November 5th. Among the rubble and debris, we came across a couple dozen banners painted on thick fabric. They had been hung over highway overpasses on Election Day. We snagged one as a memento before they were gone and my wife had the fantastic idea to recycle it into an art piece for the 1Sky project. All photos by Anne C. Savage. We hemmed. We hawed. We debated. And then we started painting. 1Sky asked that we include their name and/or logo and the phrase "TckTckTck" on the banner. The team makin' it happen! Tck...Tck..Tck... Time is running out! 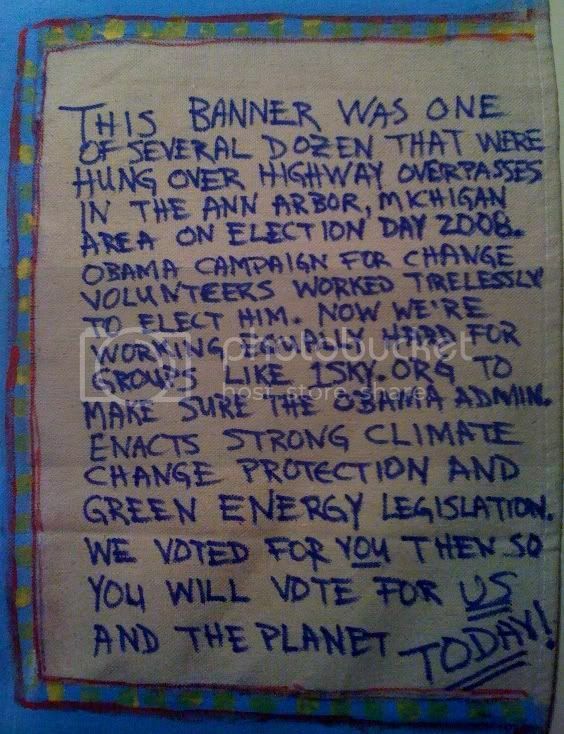 This banner was one of several dozen that were hung over highway overpasses in the Ann Arbor, Michigan area on Election Day 2008. 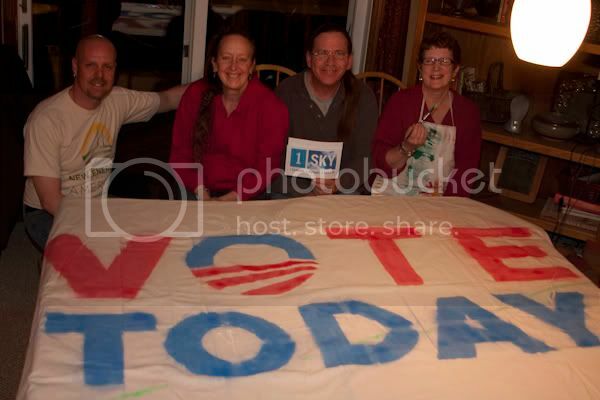 Obama Campaign for Change volunteers worked tirelessly to elect him. Now we're working equally hard for groups like 1Sky.org to make sure the Obama admin. enacts strong climate change protection and green energy legislation. We voted for YOU then so you will vote for US and the planet TODAY! We learned this week that Senate Majority Leader Harry Reid anticipates passing their version of the Waxman-Markey bill (known in the Senate as the Kerry-Boxer bill) by early in spring 2010. The delay is due to a change in focus toward reforming the financial sector once health insurance reform has been finished. While this timetable is longer than we had hoped for, it does give us more time to lobby our members of Congress and to try to ensure that some of the important goals we're driving for are met including reducing greenhouse gas emissions by at least 25% below 1990 levels by 2020 and at least 80% below 1990 levels by 2050. If you're interested in helping to pass significant climate change and green energy legislation in the next few months, I urge you to join your local 1Sky group. They are well-organized, well-funded and very effective.